When I signed up for The Spectrum’s writing course, I was excited for all the things I would learn: how to write, report and conduct interviews. I thought that, maybe one day, I’d even be good enough to be an editor. But the one lesson I wasn’t anticipating –– the one I now face every day –– is how to deal with rejection. “You need at least three sources for every story,” our adviser, Jody, said. So I was determined to find three sources. This task was easier said than done by the time I wrote my second article. “I can’t talk to you about that,” and “We aren’t allowed to speak with The Spectrum,” have become regular parts of my conversations. For every interview I conduct, five people turn me down. On one hand, I completely understand. Before writing for The Spectrum, I probably wouldn’t have wanted to talk to us either. But I have always believed in speaking your mind and speaking out when things don’t seem right. This is especially important when it comes to institutional issues. If no one ever spoke up about problems at UB, they would never be solved. 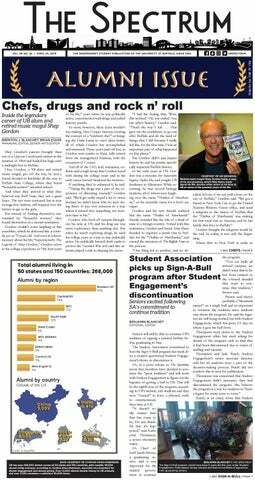 The Spectrum’s reporting has prompted increased inclusion of Native American community members at UB, the planned demolition of a dangerous old ropes course and changed UB’s photo policy to protect students. What better platform to broadcast suggestions than in a student-run newspaper? The Spectrum is made by students and for students. Our primary goal is to inform the UB community on issues pertaining to campus life. It is my job as a journalist to inform the public of current events and breaking news. This typically involves asking people who don’t want to talk to the press questions they don’t want to answer. The problem is, without the help of the public, we can’t tell these stories. I need your knowledge, your insight and your expertise to bring these stories to life. Because no matter how much research I do, I’m not an expert on every topic and my experiences may not provide enough insight. That’s where sources come in. So why are so many reluctant to speak with us? It is particularly frustrating as a student journalist when faculty and administrators say they are unable to answer my questions. And this happens on all levels. Students involved with clubs, staff members at service offices and even RAs feel they can’t talk about UB events or even dining locations on the record. When the public is no longer allowed or willing to speak to the press, where are we supposed to get information? There is no possible way for news outlets to inform the public without sources. Again, I understand. I understand people have jobs and I understand no one wants to say the wrong thing to the press. I even understand apprehension to talk to me — my 5-foot-4-inch self can be quite intimidating. But for anyone worried about things like these, just let me know. Admitting you are afraid to say the wrong thing simply opens the conversation. I am not malicious nor am I trying to make people lose their positions with the university because they spoke with The Spectrum. Because without sources, stories don’t matter. The news should never just be about an event, it should be about the people it affects. The reason we care about news is because we care about people and want to know how we are affected by the things going on around us. And that’s all I really want to know. What issues do you face and how can they be fixed? So I apologize if I have come off as confrontational or aggressive, that is not my intention. I am simply enthusiastic about telling people’s stories. I want to make a change and I want to do the best job I can. If no one is willing to give me information, I will not be able to adequately do my job. I fear I will fail as a journalist. So to all who have refused to speak with The Spectrum, I pose this question: Why? I am here to share your stories and listen to your pride and problems with the university. When things are going great, I want to report on UB’s success and when things go wrong, I want to publicize proposed resolutions. Please reach out to me; help me better cover UB news and let us put professional differences aside and work to make the university a place to be proud of. And yes, I did ask a lot of rhetorical questions in this column. It’s because no one will answer them in person.